Some eminent Igbo leaders under the umbrella of Alaig­bo Development Founda­tion (ADF) have reinvigorated the quest to secure the release of detained leader of the Indigenous Peoples of Biafra, Nnamdi Kanu. Apparently not impressed with the twists and turns in his trial, the Igbo leaders are weigh­ing several options, including the political resolution of the matter with the federal authorities. To secure a proper briefing and assess his health conditions, a delegation of ADF comprising the Foundation’s President of ADF, Prof. Uzodinma Nwala, its Chair­man, Federal Character Commit­tee, Mr. Max Ozoaka, the Assistant Legal Adviser, Mr. Max Alaeto, the Acting Administrative Secretary, Mr. Uzo Anyaso and Mr. Dickson Isaac Chidera, visited Kanu at the Kuje Prison in Abuja. Prior to this, the Consultative Forum of ADF Elders met in Enu­gu on March 29, 2016, where the leaders declared their stand on the agitations for Biafra by IPOB. Then, ADF condemned the discriminatory way the Feder­al Government had handled the case of the detention of Kanu, de­spite calls for his release by local and foreign governments and or­ganisations and despite the fact that several courts in Nigeria had ordered for his release from de­tention. In a statement issued on Sun­day on the group’s meeting with Kanu, ADF Publicity Secretary, Col. Justino Ezeoke (rtd), ADF described the treatment of Kanu and the reaction to the current agitation for Biafra as discriminato­ry when compared to the attitude of the government to Boko Har­am insurgency. Ezeoke said that while the gov­ernment has sought and indeed negotiated with the Boko Haram insurgents who have killed thou­sands of civilians and security forc­es and destroyed millions of prop­erty, it refused to do same to IPOB which employs peaceful and non-violent methods of agitation. He accused the administra­tion of President Muhammadu Buhari of unwilling to negotiate or even to dialogue with IPOB. Ezeoke said that governments and leadership of various zones including political leaders, busi­nessmen, intellectuals, tradition­al rulers, human rights groups, lawyers, pan-national organisa­tions from within and outside the Southern parts of Nigeria, have ap­pealed to Buhari to release Kanu, “whom, everyone has seen, is an unarmed, non-violent prisoner of conscience. 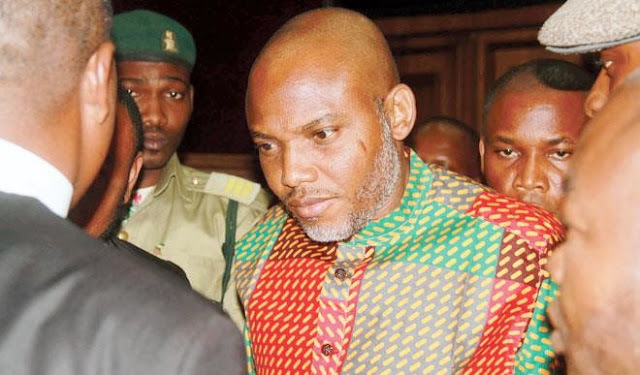 “The unrelenting spread of na­tional and global sympathy for his release is premised on the fact that his campaign for the Biafra cause is both non-violent and does not violate any known national or in­ternational laws, but rather is pro­tected by the fundamental con­stitutional rights of freedom of speech and political agitation, guaranteed even by the Nigerian Constitution. “Given the national and global reactions against Nnamdi Kanu’s unlawful detention, one would ex­pect the democratically-elected government of President Buhari to have released him long time ago, and at the same time investigate the root cause of his claims in the name of Biafra and the people of Biafra. It is the failure to release an unarmed non-violent political agitator that has led to several cases of shooting and killing of innocent civilians, particularly the youths and wounding of many more in several parts of the South East and South-South zones of Nigeria he said.